Recognize this pattern? I barely do myself, but it’s Vogue 8904 sewn in a solid color. Generally, I envision my finished garment before beginning the project, but not so this time. Sewing is not usually like a box of chocolates, but……. 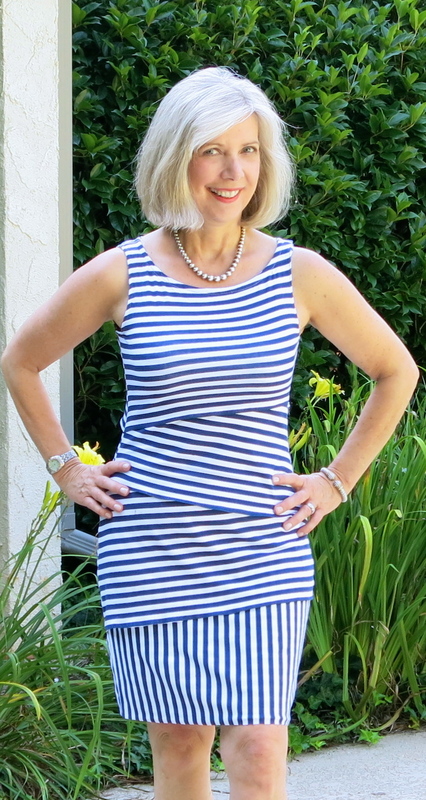 I thought I was making a tiered t-shirt dress ……… to wear with flip-flops and Jack Rogers! Determined to familiarize myself with all knit fabrics, I ordered this navy cotton jersey after buying the Sewing with Knits Craftsy course. I was going to make a hoodie as part of the course… One might say I became sidetracked. 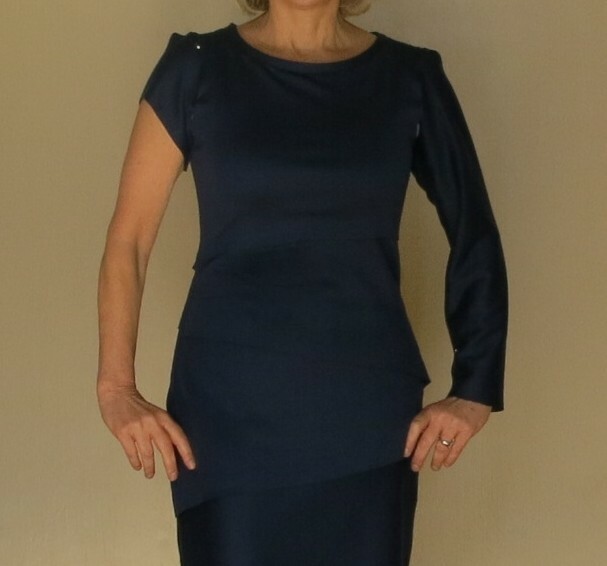 Vogue 8904 was one of my favorite 2013 sewing patterns, and I intended to make it again. 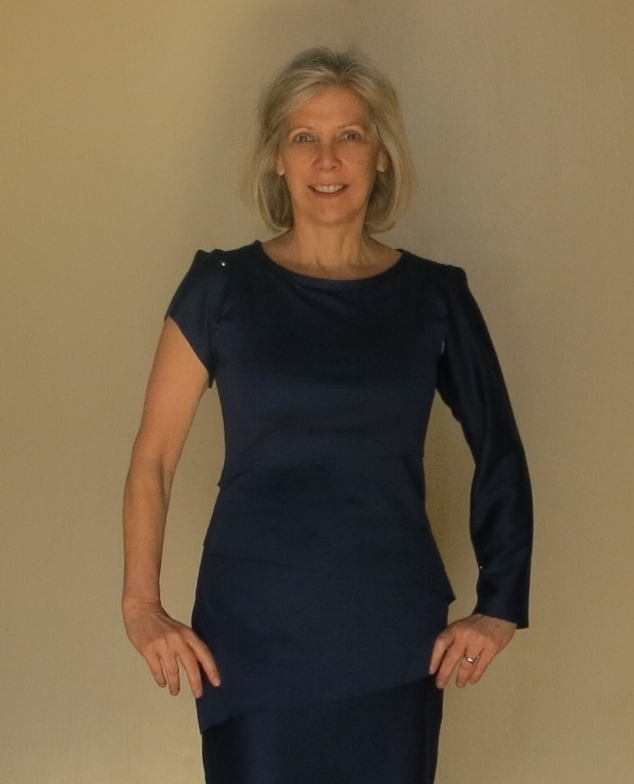 Sewing my first version with a lightweight cotton jersey featuring extreme stretch from Mood resulted in a casual and easy-fitting summertime dress. The solid blue jersey offered much less stretch, which I didn’t take into consideration. Thankfully, it all worked out but what a close call! Yes, I can breathe. 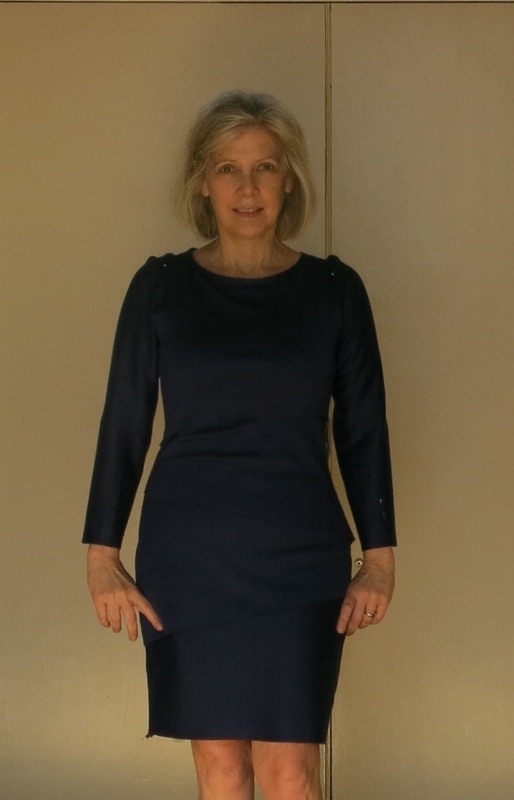 Since the dress is a double layer of fabric, which includes the base of the dress layered with the shingles, it became very heavy and too hot to wear for our moderate Spring weather. Therefore, I altered the long sleeves into capped sleeves borrowing a sleeve from another pattern. I sewed the smallest seam allowances possible and finished the seams with the serger. I secured the neckline facing with a topstitch using a double needle rather than a single stitching line. I followed Vogue’s instructions leaving all of the edges unfinished which I did not do the first time. Fortunately, I like surprises even when they make me a little nervous……. but enough surprises with my coveted Mood fabrics! Time to finish that Craftsy course.